everybody does this differently. This is just my way. Yours may be better. The title of this post is obviously a provocative lie. I’ve no idea what ‘authentic’ is when it comes to this dish. Hot? Mild? Beans? No beans? No idea. This is probably not authentic, but it is quite good. OK, that’s the disclaimers out of the way. On to the food. Chilli recipes vary enormously in method and technique, but they all start with onions and garlic softened in oil. Three medium onions, chopped finely and about six cloves of garlic, crushed, should be enough. Keep the heat medium to low, so that the onions and garlic don’t colour too much. In a separate, large pan, brown a kilo of beef mince, the best quality, leanest you can find. When the onions are soft, add chilli and continue to cook, slowly and gently. The amount of chilli to use is entirely subjective. I used two large dried ancho chillis, steeped in hot water for quarter of an hour and then sliced thinly, along with one similarly reconstituted chipotle. The anchos are mild, with a smokey flavour of dried fruit and tobacco. They’re normally stuffed and roasted in Mexico, or pureed to make sauces for enchiladas. The chipotle is a different beast – fiery hot, vicious with a distinct smell of smoke (a chipotle is a smoked jalapeno pepper). This is the one that gives the dish its kick. The onions will take on a different character as the chillis start to cook. You’ll be able to smell the chilli, the sharp power of the fruits catching the back of the throat. Toast four teaspoons of cumin seeds and two teaspoons of coriander seeds in a dry frying pan over a medium heat until they start to turn a nutty brown, and then grind them to a powder in a pestle and mortar. Add the spices to the onions and chillis with two teaspoons each of ground cinnamon and smoked paprika. You can also add some cayenne pepper at this point, for an extra kick, although this is purely optional. Let the spices cook for a couple of minutes, then deglaze the pan with a cup or so of beef stock. Stock from a stock cube is fine. Scrape the bottom of the pan thoroughly, stirring all the time, and then add two cans of chopped tomatoes and four tablespoons of tomato puree. Stir everything together, and then tip the whole lot over the browned mince. Season with salt and pepper, add a large bay leaf and top up with stock. Leave the chilli to bubble away on a very low heat, uncovered. Keep an eye on the level of liquid, and if things start to look too dry, add a splash more stock or water. After two hours, add some beans – kidney, pinto and black eye – soaked and cooked according to the packet’s instructions if you’re using dried, or thoroughly drained and rinsed if you’re using canned. Use about a kilo of beans in total, maybe three tins. After another half an hour, add two teaspoons of cocoa powder, or a few chunks of dark chocolate with a very high cocoa content (75% plus). Combining chilli and chocolate sounds strange, but the two ingredients go very well together. The chocolate will add the slightest hint of sweetness and a thin layer of bitterness to the finished dish. South and Central Americans have been doing this for centuries. Cook for yet another half an hour, adjust the seasoning and serve with rice. The finished dish is very powerful, especially if you choose your chillis recklessly. The ancho and chipotle layered a deep rustic taste into the chilli, without the sharp slice you often get from using just chilli powder. The beans take some of the edge off the heat. These quantities make a huge amount of chilli, but it freezes well and defrosts quickly over a low heat. You may as well make a lot in one go and save some for those nights when you just can’t be bothered. My chillis come from The Cool Chile Company – well worth a quick look. It sounds good to me!!!! Wow, so many layers of flavor going on in this chili. I should give it a try soon. Sounds really mouth watering with all the wonderful ingredients. 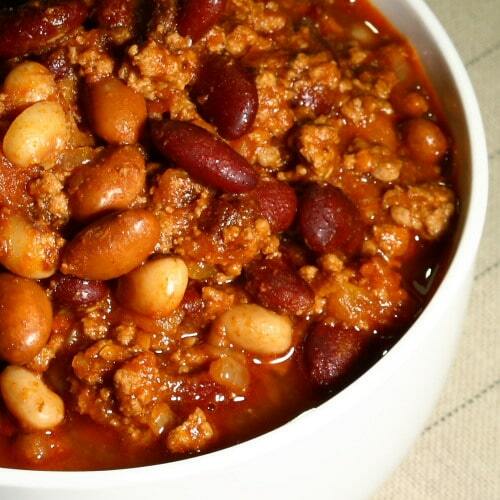 There are a lot of arguments about what is right and wrong when it comes to chili. Regardless of what is "authentic", this sounds delicious! Hmm delicious! So many flavours and so much love has gone into this dish! I love chilli, both with and without beans. Your recipe seems quite similar to mine although I don't use the reconstituted chillies. I do have some though and will add them next time, thanks for the tip! This sounds amazing. I dont go to that much effort I wish I did. My version is just onions and beef browned, tin of tomatoes, tin of kidney beans (Liam prefers baked beans… pleb) and whatever veg is in the fridge, usually mushrooms and peppers, a bit of a beef stock cube and some chilli flakes. This sounds great, Love chilli in any form!! Thanks for describing the different chiles… That clears up a lot. It is THE BEST chili. Made it tonight and it is absolutely define. The house smells great and the taste is even better, very complex but like an awesome marriage. Love the chocolate in there. Love the addition of chocolate. I love doing that too and don't find it strange at all. I think it adds a nice smoky complexity to the chili. Thanks for sharing! i totally agree with you. u simply put more of this and less of that, and u create one of the best dishes which suits yourself perfectly! and in face your chilli does sound good to me! Hot damn, this is a fine lookin' chili, sir. That's why I love chili — there is no "official" recipe. Everyone's is different and regions have their own twist. Texas tends to keep it all meat, no beans. Head over to Hawaii, they always serve it over white rice (that's how I was raised to eat it). The Midwest style of pouring it over fries has become popular everywhere. It's all good! Wasabi Prime – why, thank you. Very kind. I eat chilli in what turns out to be the Hawaiian way, just straight over rice. There's no need for salad, vegetables or other frivolities in this meal. Tasty Eats at Home, Drick, Conor – no point wondering too hard about what 'authentic' means. It's best to just get stuck in and start cooking! Katie – I'm sorry, did I read that correctly? Baked beans? BAKED BEANS!!??!! Yellie – excellent – I LOVE it when people cook these recipes. Glad you enjoyed it. I wouldn't know "authentic" from a pig's snout, but I do know that this is a cracking recipe for chilli. Great post! Sounds delicious. Never thought of putting cinnamon or dark chocolate in a chili. I am convinced that my wife's is the best on earth though. Ha ha.